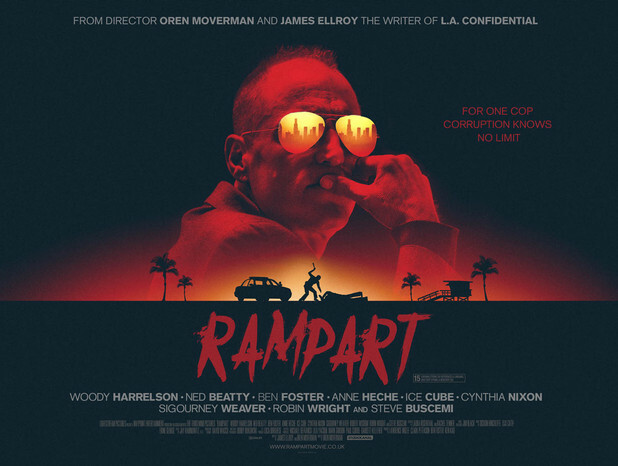 New “Rampart” Poster Kicks It Old School. | The Cineaste's Lament. ← A Brief Housekeeping Note. Here’s a nifty, retro-looking poster for “Rampart,” the L.A.-based police drama starring Woody Harrelson, Ned Beatty, Ben Foster, Anne Heche, Ice Cube, Cynthia Nixon, Sigourney Weaver, Robin Wright, and Steve Buscemi. Oren Moverman directs. “From a screenplay by James Ellroy (“L.A. Confidential”) and director Oren Moverman (Oscar-nominated “The Messenger”), comes Rampart. Veteran police officer Dave Brown (Woody Harrelson), dedicated to doing “the people’s dirty work” and asserting his own code of justice, is the last of the renegade cops in the LAPD. When he gets caught on tape beating a suspect, he finds himself in a personal and emotional downward spiral as he struggles to take care of his family, and fight for his own survival. With an all star cast including Robin Wright, Sigourney Weaver, Ben Foster and Steve Buscemi, this high octane cop thriller has been labelled “a film to file alongside the great LA noir masterpieces of the 1970s – dazzling, stunning and unique”. This entry was posted in action, Film News, Film Noir, Police Procedurals and tagged Anne Heche, Ben Foster, Cynthia Nixon, Ice Cube, Ned Beatty, Rampart, Rampart poster, Robin Wright, Sigourney Weaver, Steve Buscemi, Woody Harrelson. Bookmark the permalink.